When I was nine years old I said goodbye to my parents for two weeks in a strange place that I have never seen before. Instead of answering to them, I would now be left with two teenagers whom I had never met before to look after me. I was terrified. My parents, and my home were a nine hour drive away, and being seven years short of the driving age, I was trapped in the woods of New Hampshire for the first part of my summer. Now, this explanation makes a camp seem like a prison. And at the time it kind of felt like one. Camp can be scary and filled with many unknown elements. After that year, I decided to come back. Why? Why did I go back, and then continue to go back to the New Hampshire for the next 8 years of my life? What aspect about being in a place so far from someone’s home with people whom they have never met before makes them come back? 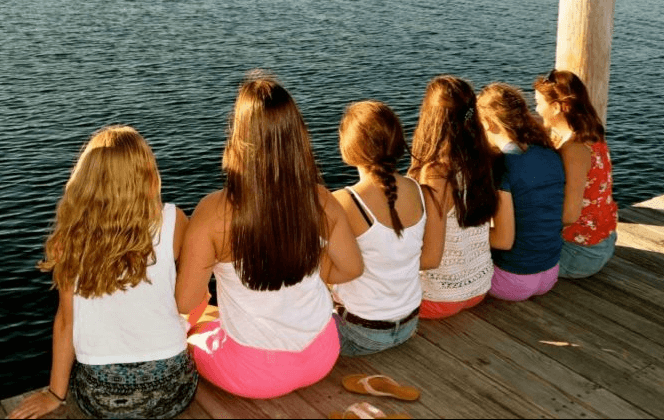 Camp has major impacts on people, especially on young women. Girls are constantly bombarded with the idea that they must be pretty, proper, and perfect. These expectations set up many walls for women because of the impossible standards they create. While it is not possible for one person to perfectly do everything, many girls overlook this fact, setting limits on themselves. This causes them to be less confident and choose to opt out actives that could potentially lead to failure. Camp can break these expectations and show young women being perfect is not a necessity. At camp, girls don’t wear makeup, expensive jewelry, or nice clothes. Between the swim classes and mountain biking in the 90º summer heat, it’s impossible. Camp strips everyone of material things and leaves a person bare. The appearance of someone’s clothing, car, or home can no longer define her. Without these material objects, a girl’s identity is solely defined on who she is on the inside. Personalities shine through because there is nothing to hide behind. While, at first this can be unsettling, girls quickly learn the power of conversation. No one knows everyone at camp and this creates an environment where it is natural to ask questions and step outside one’s comfort zone. Camp instills young women with the power of conversation. In today’s modern age, it is easy to get lost behind a screen. Camp is able to withdraw this barrier. It’s crazy to walk into a room full of 400 people eating, and see conversation flowing between everyone. Walking into a restaurant today, phones are ubiquitous. Many times when we are in face-to-face with someone we still manage to be hidden behind a screen. Camp makes this impossible; the only source of entertainment during down time is a book or the people around you. While I am no way condemning cell phones, or computers, I am simply expressing how nice it is to be without them for a change and the possibility that their absence creates. True bonds are created this way, and while campers may only see their best friends 2 out of the 52 weeks in a year, true friendships are formed in such a short period of time from the constant togetherness and lack of electronics. As a camper, I always looked up to the counselors on staff, and while I did not realize it at the time, I believe my path to becoming a feminist started at camp. As my friend, and fellow counselor Cat Maker puts it, “At camp, girls run the world and they don’t apologize for it. As a camper I saw how much fun could be had independent of boys, female staff who knew how to organize 400 people, and girls who weren’t afraid to plunge the toilet or pick hair out of the drain. As a counselor I have become one of these amazing staff members. I have learned to be confident and step out of my comfort zone, whether it be to lead a feminist discussion based on real issues with campers, or stand in front of 400 people dressed in a tutu and a bonnet”. From an early age, campers are exposed to counselors filled with confidence and who are unafraid to be who they really are. If you need help lifting a heavy boat, who do you ask? A girl. If you need help learning a new sport, who do you ask? A girl. You clogged the toilet? Thats right you get a girl to get dirty and help clean it up. Traditional gender roles don’t apply at camp because they can’t. No one is looking at men to see what to do. The leaders are all girls. When I was a camper, I never realized the impact this had on me. Each session, my camp, Camp Huckins, takes one day out for women empowerment day. The program staff plans a day filled with fun activities for the entire camp. Each activity has something to do with women empowerment whether it be as small as creating dances to music made by an empowering woman, like Beyonce, or as direct as watching videos about how the media directly affects girls and starting discussions after this. As a camper, I was fascinated by this day. I watched my favorite counselors talk about inequalities in the world that I have never noticed before. I never second guessed the all-male presidential lineup or the way the media ostracizes women due to their appearance; at the time, this all seemed normal to me. This day taught me that the status-quo isn’t necessarily right. I never imagined that I would one day be in the same position as many of my role models. It’s strange. For the past 8 year I was always looking up to my counselors. I would go to them with all sorts of problems, many existing outside of the white gates of Camp Huckins. I knew it was a hard job, requiring minimal sleep, and a lot of physical exertion and possibly a squirrel houseguest, but I didn’t really comprehend just what my counselors had to deal with. Now, after two years of training, I became one. As a counselor to 13-14 year olds, I knew I would have to deal with hard topics such as low self esteem, problems at home and possibly even mental disorders such as anxiety and depression. Being the person 40 girls go to over the course of one summer, I assumed, must entail some sad stories. One afternoon, I saw a camper crying and naturally stopped to see what was wrong, expecting something normal like a hurt leg, or homesickness. While she was not my own camper, I recognized her immediately. She’s well known as the funny camper who says she’s a witch and offers palm readings to anyonewho she passes. When I asked what was wrong, I could tell it was much more complex than my previous assumption. She had just received a letter from her mother. Her time at camp was nearing an end and she could not imagine going back to him due to her unhappy home situation. On top of her family life, she told me she did not want to go home for fear of being bullied. She told me tearfully, “At camp, I can be myself, everyone understands sometimes I’m a little slow or have a different way of doing things. At school no one cares. They think I’m weird because I’m not like them. I tried to be, but I can’t”. Hearing this, I wasn’t sure what to do. A 13 year old girl just confided in someone she barely knew. At that moment I felt like I couldn’t do it. I’m just a 17 year old girl, I don’t know anything, how can I help this girl? After my initial hopeless thoughts, I collected myself, vowing to help her as much as I possibly could. I realize camp was this girl’s safe place, where it did not matter to people if she thought she was a witch, it was part of who she is, making her even more interesting. The last few days of her time at camp, I encouraged her to branch out, make more lasting friendships, and explore more activities. In a number of days I saw her gaining confidence and friends. At the end of the session, she was still sad to say goodbye, nervous for what the fall would bring despite my reassurances that it would be okay. I gave her my address and told her to write me though I wasn’t sure if she would follow through. One day in late September I received a letter out of the blue. It was from her, telling me “home is still tough, but at school I made friends who are different like me. I thought people like this only existed at camp. I’m glad I went back because I think I changed. I’m happy and making friends now…Thank you”. Her name is Sarah, and when I first heard about her wiccan stories, I laughed. I thought she was just another quirky camper. I did not realize how wrong I was. It took everything for her to be confident with herself at camp from years of being pushed down at home. Sally is the reason I chose to do my senior assembly on camp; she is proof how camp can change a person, and just how much it means. Camp is a safe space for many, whether it be from an unhappy home life, bullies, or just the only a place where one really can be herself. Camp cultivates creativity, honestly, love and confidence. Studies have show significant differences between behaviors of those who attended camp and those who have not. According to the American Camp Association, campers are more likely to have higher sense of self (Wallace, 2013). Learning and having the confidence to be oneself are lifelong lessons that help someone into her adult life. Those who have a higher sense of self are less likely succumb to peer pressure and destructive behavior. In fact, another outcome of camp is that those who have been to camp are half as likely to partake in destructive behaviors than those who have not (Wallace, 2010). Camp is not only an enjoyable part of a summer, but also something that instills each camper with valuable lessons essential to success. The past 9 summers of my life have been filled with friendship, love, support, and positivity. I have made lifelong friends and memories and when I chose to no longer go back I know that camp will always be a part of me. Whatever I move on to do, a part of my success will be because of my summers in the New Hampshire wilderness. Camp gives girls a world of good. Thank you. “Kate Upton.” Amazonaws. N.p., n.d. Web. 3 Nov. 2015. <https://s3.amazonaws.com/rapgenius/Kate-Upton-GQ-Cover-July-2012.jpg>. “Selena Gomez.” Blogspot. N.p., n.d. Web. 3 Nov. 2015. <http://georgie8246.blogspot.com/2013_01_01_archive.html>. “Shape Magazine.” There dish. N.p., n.d. Web. 3 Nov. 2015. <http://theredish.com/img/weight%20loss%20magazine>. “Shay Mitchel.” Fanpop. N.p., n.d. Web. 3 Nov. 2015. <http://www.fanpop.com/clubs/pretty-little-liars-tv-show/images/31497631/title/shay-mitchell-magazine-cover-photo>. “Trista on US.” WordPress. N.p., n.d. Web. 3 Nov. 2015. <https://pinksandbluesgirls.wordpress.com/2008/01/25/pinks-blues-talks-exclusively-to-trista-sutter-and-the-man-behind-her-fitness-plan/>. “US Magazine.” Running with Safety Scissors. N.p., n.d. Web. 3 Nov. 2015. <http://www.runningwithsafetyscissors.com/2014/02/06/our-beautiful-bodies/>. Maker, Caroline. E-mail interview. N.d.